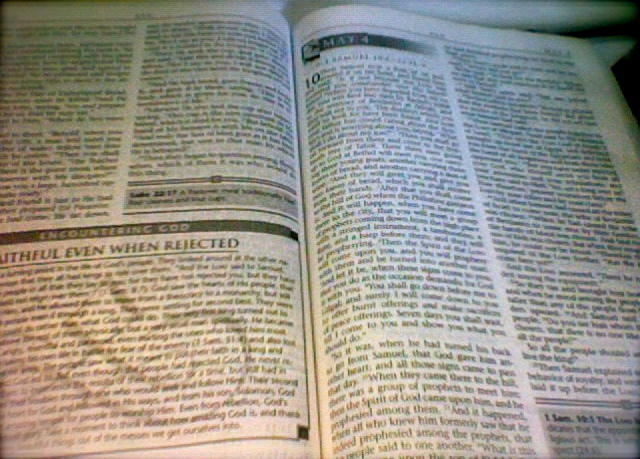 My Scripture reading for May 4th was on I Samuel 10-11, Psalms 55:16-23, and Luke 22:24-46. In Psalms, we are reminded that when we call out to the Lord, He hears us! He will save us. He does hear our voices; He knows our voices. Since we hears us and saves us when we call to Him, we can and should “cast our burdens on the Lord,” and when we rely on Him in such a way, He will sustain us! In the Luke passage, Jesus tells us that He is the example we should follow – to be a servant of all. We should aspire to be great in our own eyes, or in the eyes of others, but to be great in God’s eyes, we are to be as He was – a willful servant. I am also struck by verse 32. Jesus tells Peter that when he returns to Jesus after denying him, he is to strengthen his brothers (the body of Christ). And in verse 43, the angel of God came to strengthen Jesus when he asked for the cup to be taken from him prior to his death. We see Jesus in his prayer casting his burdens on God, and receiving strength. After the death of Christ, Peter through the strength of the indwelling Spirit of Christ, is able to strengthen others in faith. In the readings from the Old Testament, New Testament, and Psalms today I am reminded that we are to have a humble reliance on God, to be a willing and able servant, to make ourselves available to be used by Him. And as His servants who rely on Him for strength, we are to strengthen and build up others with which we have been given. Are you making yourself available as a servant to God? How are you strengthening others in Christ? This entry was posted in Daily Reading and tagged humility, I Sam 10, I Sam 11, Luke 22, Ps 55, servant, serve others, strengthen.